The Third Doctor era of Doctor Who is quite rightly fondly remembered, introducing an endearing cast of supporting characters as well as the likes of the Master and Sontarans to add to the pantheon of remarkable foes for a more action-oriented incarnation. However, although the Daleks would come to feature quite prominently in the latter years of Jon Pertwee’s tenure after a lengthy absence from screens, the Cybermen remained conspicuously absent throughout his adventures, an absence so far mitigated in the audio medium only by ‘The Blue Tooth’ featuring Caroline John in The Companion Chronicles. 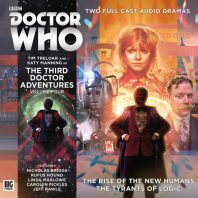 With Tim Treloar steadfastly taking up the mantle of giving this beloved era a new leading voice, the fourth volume of The Third Doctor Adventures brazenly announces on its cover that it has arrived to fill in the void left by the absence of not just the Cybermen, but the Monk as well. Writer Guy Adams opens this set with ‘The Rise of the New Humans’ as the Doctor and Jo find themselves wondering why UNIT should be interested in a man who met his death after falling from the top of a car park. When they examine him and find protuberances on his back that suggest he tried to grow wings as he fell, their fascination and research into the man’s past takes them to a state-of-the-art but remote hospital that they find filled with alien and futuristic technology. With this atmospheric setting and even a suggestive title, listeners would be forgiven for thinking that this is the promised Cyberman story, but the Doctor is much more concerned that he has stumbled upon yet another villainous plan of the Master’s before realising that it is, in fact, the Monk who is once more out to exploit time for personal gain. Rufus Hound is, of course, well-entrenched in his role as Big Finish’s Monk at this point, and it should come as no surprise that he gives an absolutely captivating performance that encapsulates everything that makes this character so similar and yet so diametrically distinct from the Doctor whom the Monk quite rightly points out decides who gets to live and die on a daily basis. Hound does perhaps add a little bit more flourish to his presentation here than usual, but it works well within the confines of this story as he actually does work to heal individuals and so poses a perfectly justifiable ethical debate for the Doctor to consider even if the actions go against the sanctity of the web of time, an argument from which even the Doctor’s morality cannot escape completely unscathed given the lives hanging in the balance. Alongside the resolute but genuinely caring Doctor Kurdi as played by Mina Anwar, the Monk is working to develop a panacea of sorts that will eradicate all illness and allow the human body to adapt to any physical ailment, but it’s very much in the trial phase with a less than sterling success rate. The Doctor understandably condemns this act for going against the natural order before being forcefully drawn into the scheme when the Monk strikes at the Doctor’s very core through Jo, and the long-term implications he ponders and weighs against the short-term benefits offer an engaging study of the differing mindsets of the two Doctors who both carry such honourable intentions. Naturally, this formula unleashes unintended consequences, and the differing forms that those costs take are fascinating and effectively tie together several loose threads regarding unwitting participants in the unsanctioned medical study, an element that Clare Corbett and Silas Hawkins evocatively bring to life with such distinct performances. With even Jo and UNIT susceptible to the effects that can spread so successfully so quickly, this is a uniquely challenging and powerfully dangerous threat with no empathy or reason to temper its goal. Katy Manning gives a wonderful performance here as Jo is tried physically and emotionally and her life is taken to the brink in more ways than one, and it remains quite staggering how successfully she still manages to recapture the intonations of a young Jo Grant no matter the situation put before her. Alongside Tim Treloar who once more gives a momentous performance that so expertly depicts the stylings of Jon Pertwee that covers the indignation, pride, and humility of the brave Third Doctor, the duo remains an established testament to Big Finish’s continuing attempts to revive this beloved era as the Monk makes his inimitable presence with predictable motives known once more.